Every hiker knows that protection on the trail is important. 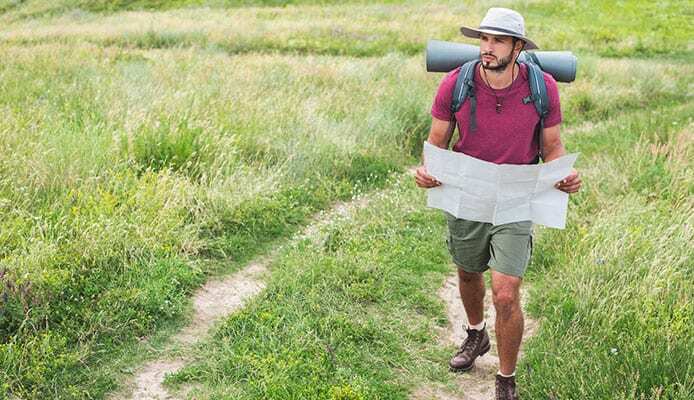 Even if a person is using a hiking guide for beginners, they understand that their safety and protection are core essentials to wilderness survival. Mother Nature is beautiful, but she is also strong. Hikers primarily need protection from extreme weather conditions like heavy rain or snow when cold weather hiking, but the sun can be extreme too. Sun protection is important on the trail because it keeps your skin from burning. With proper sun protection, you’ll feel cooler as you traverse the trails. We have made a list of the 10 Best Hiking Hats in 2018 to help you bump up your sun protection to the next level. 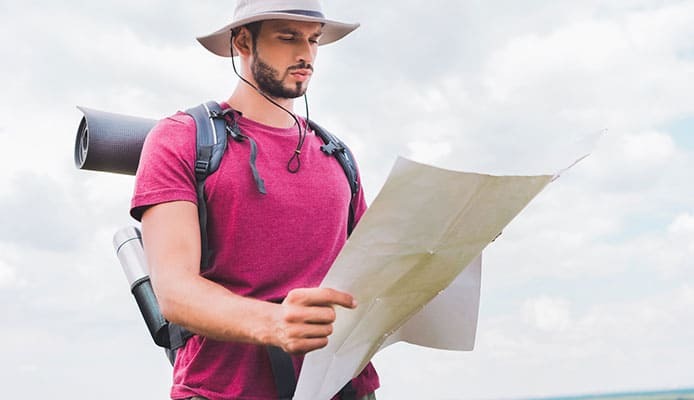 The best hiking hat would provide protection, but still be comfortable to use and wear and should be added to the top of your day hiking checklist. You don’t have to be overwhelmed by all the designs, because we have picked the top 10 for your consideration. The Endurables Airflot Hat by Tilley is a top rated sun hat for hiking that provides major protection and high-quality materials. This hat is made of nylon. This nylon is a 100% supplex nylon that Tilley calls Nylamtium. This nylon makes the hat water and mildew resistant. This outdoor hat has a medium sized brim and a ¾ inch polyester mesh panel in the crown for added breathability. The underside of the brim is dark for glare protection and there is a secret pocket in the crown for storing small items. This hat offers a UPF 50+ sun protection rating. To clean this hat, you can put it in the washing machine on delicate or hand wash. The Bora Bora Booney II Sun Hat by Columbia is made with advanced technology and is packed with added features. 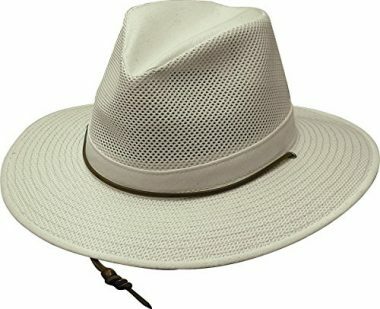 This trekking hat is made of out 100% nylon poplin. The fabric has Omni-Wick to help get rid of and prevent the buildup of sweat. There is a UPF 50 rating, which blocks out 98% of the sun’s harmful UVA and UVB rays. 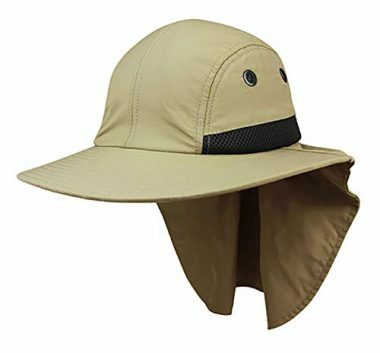 This hat is perfect for fishing as it features a mesh breeze vent to help keep you cool and protected while you spend long hours on the water. 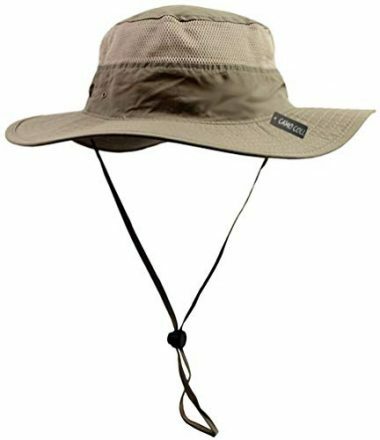 This outdoor hat has an adjustable drawstring cord to ensure that it fits comfortably and snug on your head. The hat has a men’s fit and comes in one size. With Columbia’s design, you’ll have the perfect accessory to venture out on to the water. The Aussie Breezer Cotton Mesh Hat by Henschel is made of 100% cotton mesh. This polycotton mesh is packable, so you can easily tote this hat to any location. There is an adjustable chin cord to help personalize the fit and keep the hat securely on your head. The hat has a wide 3-inch brim that will keep the sun out of your eyes. The underside of the hat is unlined, but there is a soft sweatband to keep you cool. This hat boasts a UPF 50+ rating to ensure you get full sun protection. The hat is completely crushable and packable due to the 1-inch self-band, which holds it together. Thanks to this band, the hat makes traveling easy. This hat is idea for all outdoor activities from hiking and fishing to camping. 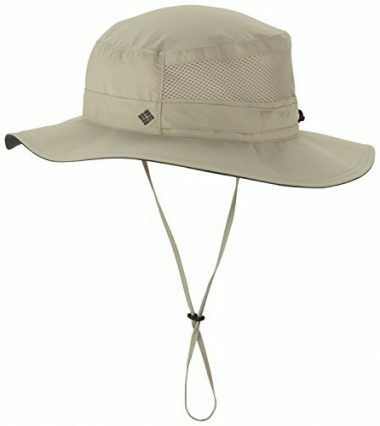 The Seattle Sombrero by Outdoor Research is a top rated sun hat for hiking that is made of 100% nylon. This hat features a removable and adjustable chin cord with a lock. The chin cord allows you to personalize your fit or rest your hat down your back when it’s not needed. The brim of this hat is foam stiffened to keep its shape and make the hat buoyant, in case it ever falls in to the water. There are matching look and hook tabs on the dome and brim of the hat, which can help adjust the fit. A Gore-Tex fabric membrane makes this hat windproof, waterproof, and vapor permeable. The brim is longer in the back to give your neck extra protection from the sun. 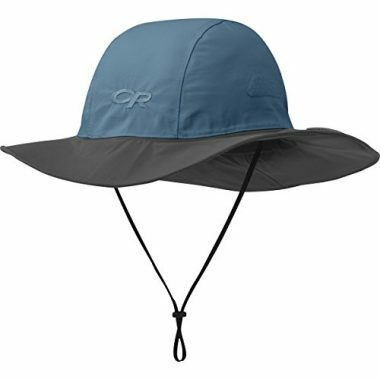 Keep the sun at bay with Outdoor Research’s best hiking hat. The Outdoor Flat Hat by DDYOUTDOOR is a full protection hiking sun hat. This hat has flaps in its design that deliver complete sun protection for your head, face, and neck. There are mesh sided panels with brass eyelets for ventilation. This hat is windproof and quick-drying. It has a UPF 50+ rating and is great for any outdoor adventure. This is a nylon hat that is one size fits all. It is easy to carry because it has a collapsible design. 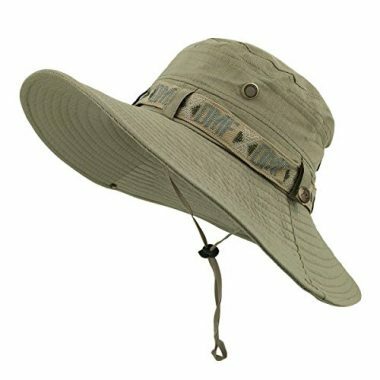 The Outdoor Sun Hat by Camo Coll is a cotton and polyester design that is lightweight and comfortable. There is a mesh section to help keep you cool and an adjustable drawstring. You can customize the fit with the drawstring and ensure that your hat stays secure on windy days. 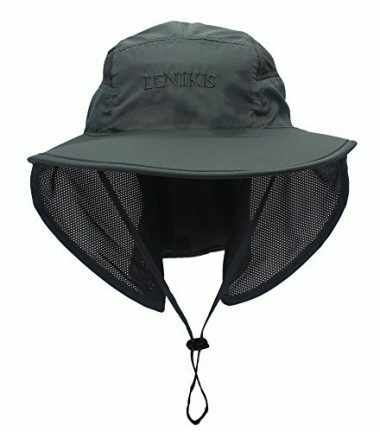 This Unisex Sun Hat by Lenikis offers full UPF 50+ sun protection. This hat has flaps that can fold down to protect your head, ears, and neck from the sun’s rays. 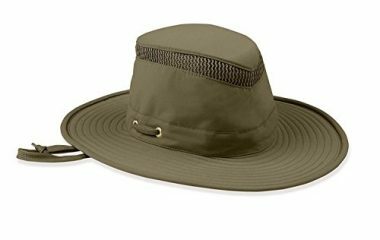 This trekking hat is made of lightweight polyester that is also quick-drying, foldable, water and stain resistant. There is a breathable mesh side panel to allow for decent ventilation. The hat is a one size fits all and comes with an adjustable chin strap. This Sun Hat by LETHMIK is made of waterproof polyester. This hat is perfect for fishing and features a unique snap brim in the design. The hat is unisex and one size fits most adult head sizes. There is an adjustable chin drawstring to help hold that hat in place. This hat is foldable and crushable for easy packing. However, you should not machine wash this hat. The Sombriolet Hat by Outdoor Research is a nylon and polyester blend. This hat features a foam stiffed brim to ensure that it floats in water. 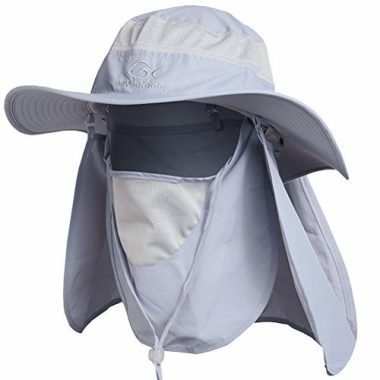 This top rated sun hat for hiking is lightweight and protects against the sun, heat, and humidity. It has a mesh lining and vents to keep you cool. There is a UPF 50+ rating, TransAction headband, and chin cord. The 4 Panel Flap Hat by Top Headwear is a great outdoor hat. 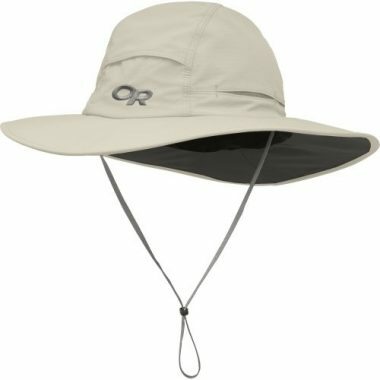 This outdoor hat is made out of 100% polyester and features 4 panels for sun protection. The elongated back flap connects to the brim, which is extra wide, to deliver maximum sun protection. With Top Headwear’s design, you will get full coverage protection. The hat comes in a khaki color and is one size fits most. Hikers understand that hardshell jackets, hiking vests, hiking pants, hiking boots, and hiking socks can all be used to have you hike comfortably and safely. All your gear add protection to your body on the trail, but often a hiking hat is the item left forgotten on hiking and backpacking checklists. There are many different designs of hiking hats and when it comes to choosing just one, you want to be sure it’s the best one. There are differences to each hat design that can enhance your experience and comfort on the trail. You should easily be able to pack and use a hiking hat, so that you keep your head, face, and neck protected against the sun. A brim is a smart idea on a hat because it is what gives you protection from the sun. Manufacturers and the FDA suggest that hikers use a wide brim hat that is made out of firmly woven fibers for optimal sun protection. However, it is important for hikers to find a good balance in the width of the brim. A hat that has too wide or too floppy of a brim can obstruct a hiker’s view, which is dangerous on the trail. The most common suggestion is to get a hat that has at least a 2.75-inch-wide brim and if the brim is darkly colored on the underside, it is even better. The dark color can help reduce glare. UV rays can reflect and scatter across various surfaces. One of the most reflective surfaces is snow, which can reflect up to 80% of the rays. A dry beach can reflect 15% and sea foam 25%. Reflection important to consider with the shape of the brim, because light can reflect off of things and get under the brim of your hat. The best brim shape will be one that curves down and sits closer to the face. The close proximity and curve can help stop some of the UV ray’s reflection. However, the brim should be chosen carefully according to your activity. If you are hiking or fishing, a hat with a brim that is too curved can be an obstruction to your vision. Lighter colors can reflect the sun better. It is best to choose a light-colored hat for protection because it can help deflect some of the rays away from your head and face. A lighter color will also not get as hot to the touch as a darker one. Hats that have a dark color on the underside of the brim are even better. The dark underside can help absorb some of the reflected light, but being on the underside of the brim, aren’t prone to getting hot to the touch. However, lighter colors can be harder to keep clean. Therefore, natural off-white colors like beige, khaki, or ivory are excellent choice for a hat color. The material of your hat should fit its intended use and intended climate. For hotter temperatures, a lightweight material is the best. Even better if it is breathable too. Remember that the type of material can change your ability to wash your hat. Some design will be machine washable and others won’t. The material of the hat can also affect the brim. There are stiff and floppy materials that give you different style brims. Finally, some companies have designs that are made of a water-resistant material. This can be great for the fisherman or water explorers, because a hat won’t sink and be lost if it is dropped in the water. A hiking hat should be breathable. A hat that is breathable will keep you cooler and it also tends to be lighter in weight. Hats can quickly get sweaty when they sit on your head for long periods, especially when you’re already sweating on the trail. A breathable hat can help you stay cooler by allowing your sweat to dry. It is important that your hat is comfortable for you. However, the comfort of a hat can depend on an activity. 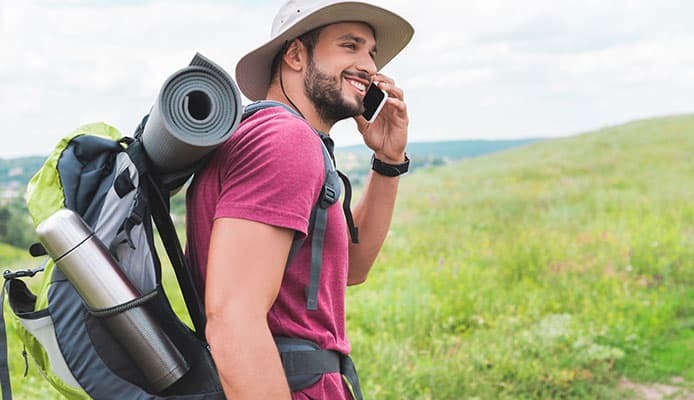 If you are climbing or hiking, having a large brimmed hat would most likely be irritating because it would constantly hit your back as you looked around. If you are a runner and have a hat that isn’t properly fit, it can be easily lost in the wind. You should be sure to find a hat design that is comfortable for you, but also works for your activity without obstructing your view or becoming a nuisance. Sturdiness of a hat can be dependent on a few different factors. Mainly the color, material, and construction can all affect whether a hat is sturdy or not. The best hats are an off-white color. This is because stains aren’t as likely to show up versus an all-white hat. The material of the hat should be sturdy too and you shouldn’t be afraid to invest in high-quality. For example, always choose a nylon hat over a straw hat. Nylon will be much longer lasting. Finally, a hat that is constructed well, should last you for a long time. Every hat will have a different maintenance and care routine based on the manufacturer and materials used. It is best to see if the manufacturer provides any guides on the maintenance and care for your hat. However, most hats should be able to withstand a hand wash. To wash your hat by hand you should use cold water and a soft brush, like a toothbrush, with mild soap. You can gently brush out stains. Do not use fabric softeners because they can degrade the material of your hat. When the hat is still wet you should reshape it to its original shape. It is extremely important that you perform regular maintenance and care on your hat. Sweat and the salt in sweat can rapidly degrade a hat and allow for the buildup of rot. When you are not using your hat, it should always be stored bone dry. Similar to sturdiness, durability is important. A high-quality outdoor hat should last you for years to come, even if it is dragged through rugged terrain and battered by extreme weather. If you properly care for your hat, you can extend the durability and ensure that your hat is always ready to go on the next adventure. UPF is the ultraviolet protection factor, which determines how intense the sun’s rays are and how much protection you need. Commonly you will hear of UVA/UVB ratings, which determine how high the UPF rating is. The best hats will block UVA/UVB rays and that means having a high UPF rating. Fit is important because it is what keeps your hat comfortable and secure to your head. Outdoor hats need to fit well because you will be moving a lot when wearing them. You should be able to freely move your head without worrying that your hat will fall off. A well fit hat also stands a better chance against wind. Even a slight breeze can easily dislodge a hat if it is not well fit. The better the fit, the better your hat has the chance to stay on your head. As mentioned throughout, a hat is designed for protection. Its main job is to protect your head, face, and neck. You should find a design that maximizes your protection to ensure you don’t get burnt by the sun’s rays. Q: What is UPF and why is it important? A: UPF stands for ultraviolet protection factor. This is a measurement of the level of UVA/UVB protection that your hat offers. If a hat boasts a UPF rating of 50, it means it blocks 98% of UV rays. UVA/UVB protection is important because the sun’s ray can lead to skin cancer. Skin cancer is the most common type of cancer and 20% of people in the US will experience battling it in their lifetime. You can take the steps to protect yourself by having a good UVA/UVB sum protection ethic. Hot weather hiking tips will point to a hiking hat as an excellent way to give yourself some much needed protection. Q: How do you clean a hiking hat? A: You should look at the manufacturer’s manual to see if they provide a guide for cleaning your hat. Every hat is different and cleaning it can be dependent on what material it is made out of. Different materials can withstand different cleaning methods. In general, you can hand wash a hat with cold water. If there is a stubborn spot, you can use a soft brush to gently scrub it away. A hat should be reshaped when it is wet. You should airdry your hat and always store it completely bone dry. A damp hat that is stored is prone to developing mold or rot, which causes major damage. Q: How much protection do I need? A: Not much. Having any layer that can provide shade or cover your head, neck, and face is sufficient protection. The ideal goal with a hiking hat is that it provides a layer between you and the sun’s rays. This means that you aren’t directly being hit by the sun’s rays, which helps keep you cooler and prevents the risk of skin cancer. Especially, if you are hiking with kids, you will want to ensure they stay safe from the rays of the sun too. A hiking hat is the best choice to add a lightweight layer of protection to your child’s head. When it comes to your hiking hat, finding the best design can greatly enhance your time on the trail and have you looking stylish. With these top rated hiking hats, you can have peace of mind that you are actively protecting yourself from the sun’s rays. The best hiking hat will keep you cool and help block some of the sun’s harmful UV rays. If you know exactly what you need and want, you can save time and money by investing in the best hiking hat for you! Do you own one of the hiking hats that made it onto our list? Let us know how it has worked for your outdoor needs in the comments section below.